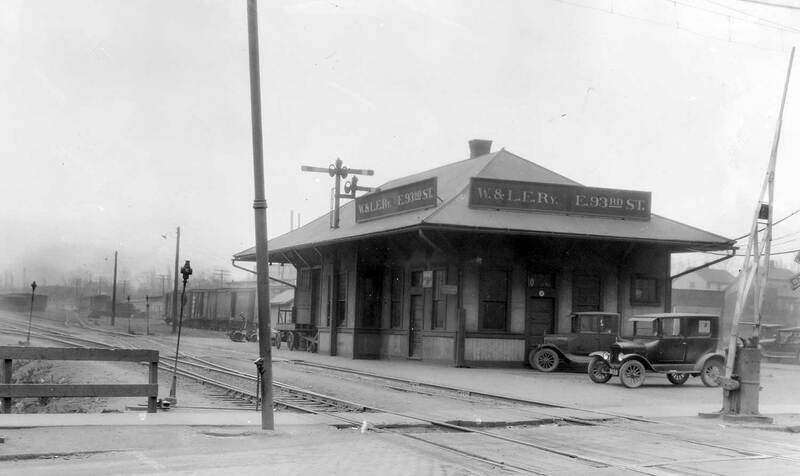 Wheeling & Lake Erie East 93rd Street depot, 1927. Image from the Cleveland Memory Project of the Michael Schwartz Library at Cleveland State University. As a railroad modeler, I answer many questions about this hobby. A regular question from other modelers has been, why model 1926? This sounds simple, doesn’t it? Just explain why I model a specific year. Oddly, I’ve been trying to write this for three weeks and it comes up a little different with each new version. I think I finally like how this has turned out so I better post it before I change my mind, again. Besides, I have models to build! We all have reasons for building our model railroads so we maximize our hobby enjoyment. We make choices for a variety of reasons and often we are heavily influenced by experiences earlier in our modeling careers or by what we enjoy in the hobby press. Over the years, my reasons have become focused on following the prototype as a guide. I was attracted to Eastern narrow gauge lines for many years. I was drawn to the smaller equipment and how they served towns that were off the beaten path. But my narrow gauge modeling and layout wasn’t moving forward. I realized that regional standard gauge railroads had similar charms in the 1900-1930 decades. Western Maryland railway repair yard, Elkins, W. Va., 1939. Image from authors collection. I was living in West Virginia at the time and the Western Maryland Railway caught my eye. I had bought a few detailed history books on the railroad and pulled together details from the texts to create a timeline on a spreadsheet. Timber was declining rapidly but coal was on the upswing. The freight car fleet was changing, too, which fanned my interest as information was gathered. November of 1926 was originally chosen when I built a layout set around the Western Maryland Railway operations in Elkins, W. Va. Not only was the railroad interesting at this time, but so was the National freight car fleet as older wood sheathed box cars were beginning to make way for newer steel sheathed box cars. After moving to metro-Cleveland, Ohio, my prototype interests changed but the 1926 era was kept. Living in a larger metropolitan area, I began to notice factors of the 1920s that were different from the post WW2 years. One constant for each of my model railroad projects has been the freight cars on the tracks. The above image is from the Library of Congress digital collection and shows a portion of Potomac Yard near Washington, DC. The photo is dated 1925 and mostly wood sheathed freight car designs are in use. In just twenty years, the look of the freight car fleet would be very different as about half of these wood sheathed cars would be replaced by newer steel sheathed car designs. 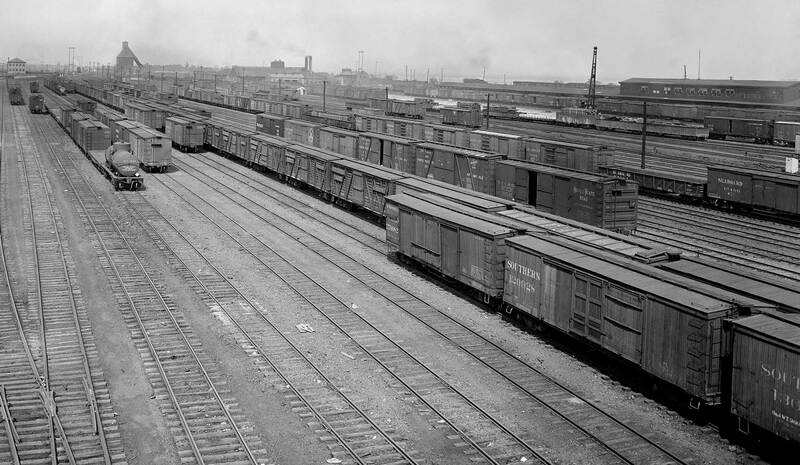 The 1920s were a decade of transition for the freight car fleet as old cars with smaller capacities were being replaced with larger cars constructed t new designs that had larger cubic capacities. The 36-foot box car still dominated the rosters, but few followed a standard design. The USRA cars of 1919 introduced standardized car designs used across many different railroads. Bud Laws, B&O 2339 at Benwood Yard, Benwood, W. Va., May 1934. Image retrieved from the B&O Steam Locomotive Roster website. Locomotives would also have a different look in later years. There were no diesel locomotives in 1926 freight service. Many smaller locos, like the B&O consolidation seen above, would see regular use in yards and on the main lines. Development of larger, faster, and more powerful steam locomotives was a few years into the future. 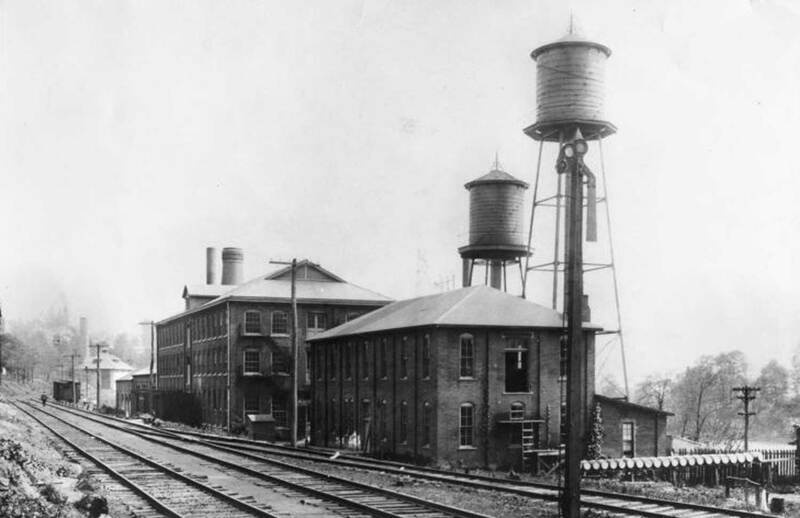 Wiliam R. Jones Glass Factory, Seneca, Morgantown, W. Va., 1920. Retrieved from the West Virginia Historical Photographs Collection. Image ID 008433. Industries had a different look in the 1920s, too. There were many more small and mid-sized industries dependent upon the railroads for service. Within thirty years, many of these smaller industries would expand operations, or build larger modern facilities to meet business demands. Several industries, such as glass factories and tin mills, would slowly disappear as larger, more efficient operations outproduced the smaller facilities, or new technology would mean the end of an older process. While these industries may have been smaller than later versions, they needed rail service that fits well with our model railroad spaces. Unknown freight house location. Image from authors collection. 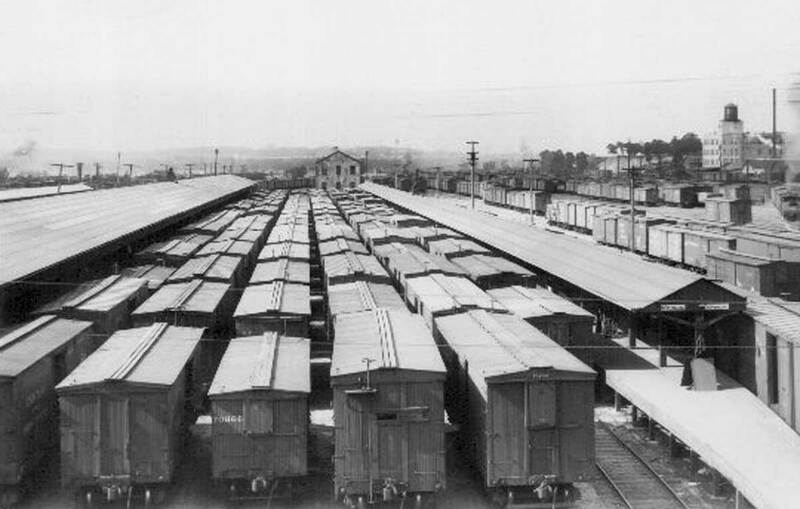 Freight houses and team yards were beehives of activity in the Teens and 1920s as goods were delivered there for for wholesalers and retailers to sell to the local populace. 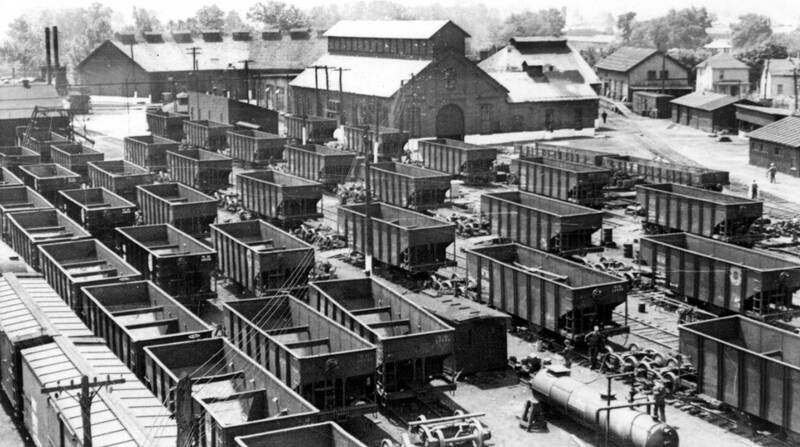 Less than carload freight was also a larger factor in the pre-WW2 decades, which increases the freight house and team yard action. Those are the main factors that inspire me to model 1926. It becomes more interesting as I discover more about the railroads and industries of the era. In many ways, it’s a forgotten time. Quite a few railroads operating then were gone form the scene within two decades as they were merged into larger companies or abandonded. Several popular railroad emblems were not used on freight cars, which makes quite a foreign appearance. The 1920s are a fascinating decade to research and explore. I’m sticking with 1953, but you did a great job of explaining your choices. Throughly enjoyed the blog. Great article that explains why I chose 1926. Mainly interested in operations and many more opportunities. Now just have to complete more of those “shake the box” Westerfield models! I have a lifetime supply. A lot of MDC and Walthers stand-ins right now. Thanks for the encouragement Eric. I’ve build a dozen so far, but too busy with the layout construction at this time. When I get start in earnest, I’ll build all the same kits at one time. As an aside, I found a 2″x6″ diamond honing block at Harbor Freight for $10 (4 grits) that works great for thinning stock car sides. Why model 1926? Umm, more off the shelf products are available than for 1629? Honestly though, like you said, lots of things happening. If life and I both had been different in the 1980s I would have liked to model early PRR electrification and some interurban operations. ARE vs REA. The Railway Express Agency had not yet been formed out of the many smaller agencies, and the American Railway Express was the major player. The ubiquitous green trucks and red diamonds were not all over the place, as on other layouts of the transition era. I like the distinctive difference of modelling something that others are not. The variety of unusual freight car types – pickle cars, poultry cars, ventilated cars, etc. And a third would be horse-drawn vehicles sharing the road in many places with those new-fangled infernal combustion machines. I try to stick with a pre-March 1929 date on the rolling stock (since that’s the ARE to REA transition date, at least on paper). But why did you pick 1926 specifically (vs ’25 or ’27 for instance)? I model 1934 in North Carolina, where industry and farming and roads are probably much like 1926 in the northeast, but Prohibition is over and billboard reefers are not. All post hoc justifications because the real reason is that I found a conductor’s wheel reports from January to September of that year, and solid historical data helps so much for early modelers. Eric – A great article and I agree with all your points. Another reason to model an earlier time in my mind, is the, somewhat limited availability of RTR equipment compared to everything else. As general guideline, this helps me stick to purchases that really matches my era such. I attempt to model the PRR just before the U.S. became involved in WW1 or about 1915-1916. While there is quite a bit of models to purchase these days that fit that general era, it doesn’t seem nearly as prolific as a more modern era. I’m not a rivet counter by any means, but I want the general feel. This keeps me satisfied with kits, kit-bashing and even occasional scratch building.